The Black Diamond Guest Ranch and Resort is different, affordable and fun. Perfect for individuals, families, groups and the year round enthusiasts. Our authentic 80-year-old log cabins, from historic Circle City, sleep up to five people and have been modernized with private baths, microwaves, coffee pots, stoves, refrigerators, and propane heating. Our Bunk House can hold groups up to fourteen people with the same modern conveniences. Outside we offer picnic tables and fire pits in a very large and beautiful park like setting. For the adventurer, our unique Wall Tents offer the true outdoor feeling with lodgepole-pine bunks and stoves, and are set back in the forest. Just minutes from the Ranch, you will find the route of the Hiawatha Bicycle Trail, Lookout Ski Area, wildlife viewing, ATV and groomed snowmobile trails, fishing in the St. Regis River and mountain lakes. We offer trail rides into the beautiful Lolo National Forest, and we have facilities for your horses and a Walk-In Cooler for our hunters. When you stay with us at the Ranch, you are family. 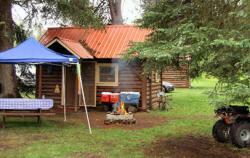 The Black Diamond Guest Ranch truly is your gateway to great outdoor fun and relaxation. Whether for just a night, or for the week, one or many, we can accommodate you. Our large and modern pavilion offers a great place to hold meetings, get-togethers, club functions and weddings. It also is a place where guests can enjoy games of pool, ping-pong, foosball, board games, and TV while relaxing by a roaring fire after an invigorating day in the mountain air, and don't forget our hot tub; it's a great place to soak. Directions: Black Diamond Guest Ranch and Resort is located 18 miles east of the Montana/Idaho panhandle border on Interstate 90. Take DeBorgia Exit 18, if coming from Missoula, turn right at stop sign onto Frontage Road and proceed 1 mile east to gateway and cabins on the left. If coming from Spokane area, take DeBorgia Exit 18 turn left to the Frontage Road and turn right and proceed 1 mile east to gateway and cabins on the left.